Although much art of the Islamic world is highly decorated and colourful, at times there was also a taste for more plain, understated work. This is particularly true of the Ottoman period (late 1200s-1924), when silver and brass objects were often left completely undecorated. Instead objects depended on their form to make an impression otherwise achieved through colourful painting or intricate detailing. The lower part of this tulip-shaped candleholder has pairs of leaves inlaid in niello, a black metal alloy, as an ornamental band. Inverted palmettes have been engraved just below the dividing point of the petals and the large vertical rim around the shoulder is decorated with a pierced, foliate pattern. These limited decorative elements allow the impressive size and shape of the candlestick to provide the visual impact. 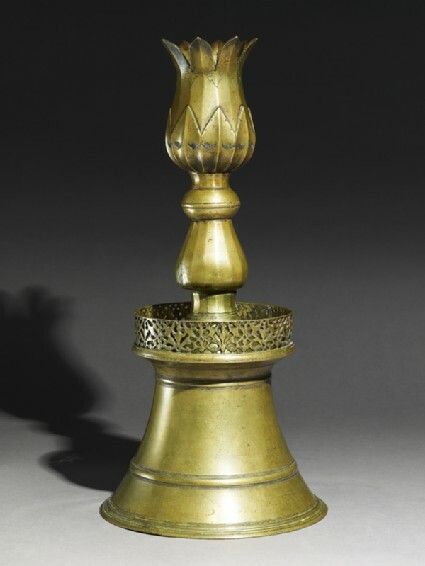 The candlestick’s size, weight and quality of casting suggest that it may have been used in a public setting, perhaps at the imperial Ottoman court, or in one of Istanbul’s great Ottoman mosques. In Turkey large candlesticks are traditionally placed either side of the mihrab, the niche indicating the direction of Mecca, and therefore the direction of prayer. Purchased with the assistance of the MLA/V&A Purchase Grant Fund, the Art Fund, and the Friends of the Ashmolean Museum, 1990.